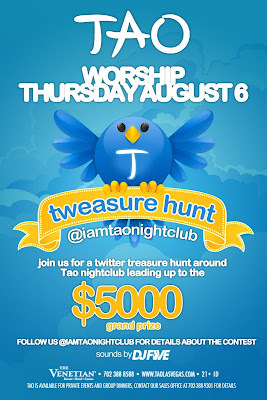 TAO GROUP BLOG TAO NIGHTCLUB LAVO NIGHTCLUB TAO BEACH LAS VEGAS: TWEASURE HUNT!!!! GAME ON!!!! THANK YOU FOR YOUR INTEREST IN TAO’s TWEASURE HUNT! WE are very excited to lead you around TAO Nightclub on a chase for the $5,000 Grand Prize! · If you are found to be working in a pair or group you will be disqualified. · At 1:00 am we will tweet out the ending clue of the location to meet us to present us your photos: THE FIRST PERSON TO ARRIVE ON SITE WITH ALL 6 PHOTOS, CORRECT PHOTOS OF THE CORRECT OBJECTS, WILL BE THE WINNER OF THE $5,000 PRIZE. Great idea! Let the tweets and pix begin.